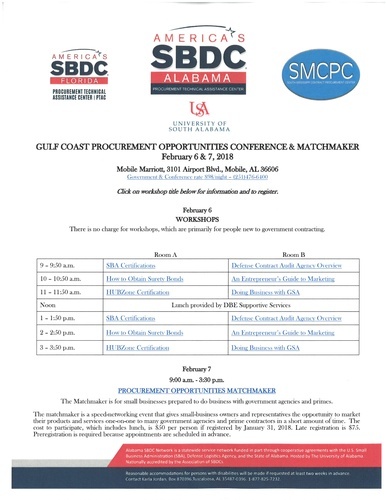 This year’s Gulf Coast Procurement Opportunities Conference & Matchmaker February 6 and 7, one of the largest events in Alabama for small businesses interested in doing work with the governments, is less than 2 weeks away. Workshops on a variety of topics related to what's involved with government contracting will be held February 6. There is no charge to attend the workshops. The matchmaker scheduled for February 7 is a speed-networking event that gives small business owners the chance to meet one-on-one with small business liaisons from more than 30 local, state and federal agencies as well as prime contractors. This year for the first time the matchmaker will include representatives from Airbus and Hyundai. A $50 per person registration fee for small businesses is required to participate and will increase to $75 after January 31.